PG13 : Dare to Try these Sweets and Snacks? Your trick-or-treating days may be long past, but you can still enjoy yummy treats…no costume required! Would you dare try these new sweets and snacks with us? Skittles we all know and love are sweet, fruity, and bursting with flavor. Times are changing, though, and Skittles knows they have to keep up with shoppers who are antsy, craving change, and also looking for something that photographs well for Instagram. Their response? 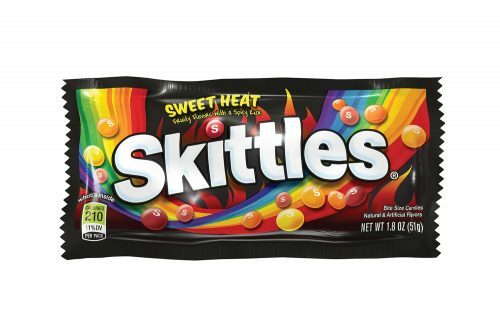 Sweet Heat Skittles, the new variety of the iconic candy that has a spicy twist. Making up the tangy treat are Sizzlin’ Strawberry, Fiery Watermelon, Flamin’ Orange, Lemon Spark and Blazin’ Mango. Settle in tight, this is a fun one! The original fizz power candy is just like you remember it – delicious hard candy with a sour fizz in the middle. 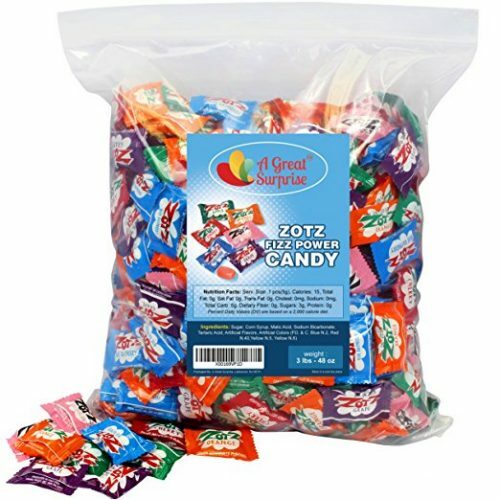 But with Zotz fizzy candy on the other hand, all that sour fizzy surprise was concealed in the centre of its hard candy shell. There was no patient waiting for the cherry or blue raspberry lozenges to melt, always one decisive bite that delivered an explosion of enough foam that could cause a serious headache (jokingly). Things are about to get sticky, Grenades Gum is an explosively, intense, sugar free gum that packs a mint blast unlike anything you’ve experienced before. 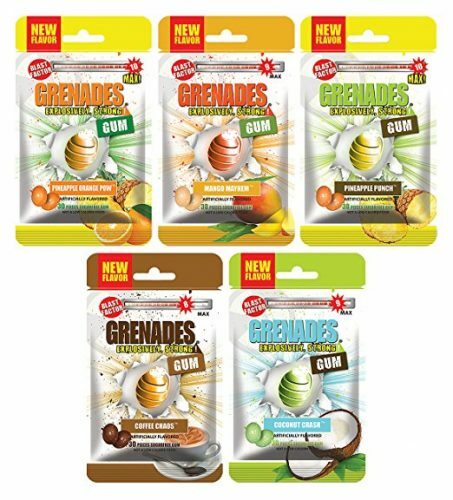 From the moment you pop a Grenades gumball into your mouth, you’ll feel the cooling mint sensation explode into a nose tingling, eye watering, mind numbing rush of pure exhilaration! Definitely not a gum for the faint of heart. With 10 delicious flavors to chose from, you can’t go wrong, but take heed of the Blast Factor ratings. You’ve been warned! 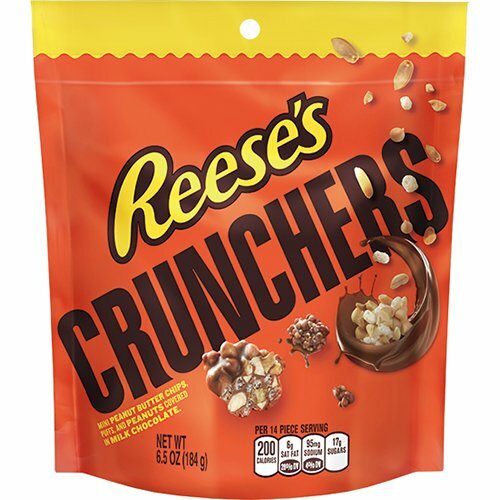 If you haven’t tried Reese’s Sticks or Reese’s Crunchers, you’re seriously missing out in the realm of chocolate-peanut butter products. They are perfectly munchable, deliciously crunchy snacks with mini peanut butter chips, puffs, and peanuts covered in milk chocolate that satisfies even the sweetest sweet tooth! 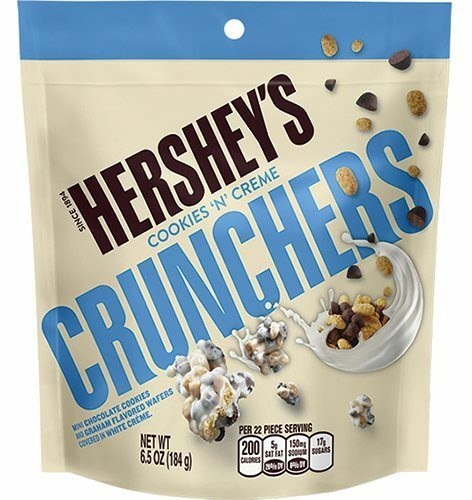 HERSHEY’S is changing the game with their new HERSHEY’S Cookies ‘N’ Creme Crunchers Snacks. These NEW Hershey’s Cookies ‘n’ Creme Crunchers are an utterly crunchy, incredibly munchable snack! Featuring fun little crunchy bites that contain mini chocolate cookies, crunchy graham wafers – completely covered in white chocolate creme! If you love Hershey’s candy and haven’t tried these, then you really need to! Will “Sweet and Spicy” become the hot new snack trend? Let us know on the comments below!